We are Jen Squillario and Ian Taylor, two lawyers (don't let that stop you from reading this), with a passion for travel, wildlife, wine, photography, and outdoor activities. We currently live in the historic town of Annapolis, Maryland. We discovered a shared passion for travel while in law school during a summer semester abroad in Aberdeen, Scotland. We explored Scotland, Ireland, England, France, Belgium, the Netherlands, and Switzerland--backpack and hostel style travel (hard to forget sharing a bedroom with 12 strangers or getting woken up by a police German Shepherd at the train in Nantes, France during the World Cup). We developed a love of wine while studying for the bar. No explanation should be needed on how that started. We'll admit, we had no money and started with box wine, but we think our tastes have elevated some since then. If it tastes good, it is good. Right? As for wildlife, Ian found our second dog, a Beagle Basset Hound mix, on the street, and she was wild (she even buried her food . . . in Ian's gym's bag). And, Jen would not agree to a second date with Ian until he agreed to run with her, outside. Our love of photography (i.e., Ian loves Jen's photos and playing Jen's assistant) came a bit later. Jen always took photos when we traveled, but it was not until after our first trip to southern Africa that this hobby became more serious for Jen. After law school, on a shoe-string budget (and sometimes with help from friends and family), we explored England (visiting Jen's brother on his semester abroad), Hawaii, the beaches of the East Coast U.S., and the Canadian Rockies. Jen wanted that first trip to the Canadian Rockies in 2001 to be a trip to South Africa, but she was overwhelmed on how to plan such a trip and probably a bit short on budget. Jen's difficulty in trying to figure out how to get us to South Africa then turned out to be fortunate as that first trip to the Canadian Rockies spawned a love affair with that area, and we have been back many times in the winter months to ski/snowboard and explore Alberta's and British Columbia's majestic mountains. The view from www.revelstokemountainresort.com in British Columbia, Canada. This photo was taken while skiing (Jen) and snowboarding (Ian), using a little Nikon point and shoot that can fit in Ian's coat pocket. In the Canadian Rockies, in the winter, we have seen big horned sheep, mountain goats, elk, and wolves. In the summer, we have also seen moose, grizzly bears, and black bears. Between 2001 and 2007, we broadened our travel horizons during the winter months, traveling to Jackson Hole, Wyoming and to the ski mountains outside of Salt Lake City, Utah. When not skiing the Canadian Rockies, we can be found at one of these incredible ski destinations. And, in that age old debate of where would you live if money was no object, Wyoming often beats out South Africa for Jen, a bit of a shocker really! The National Elk Refuge outside of Jackson, Wyoming. See www.jacksonhole.com for more information. In the winter months, we have seen elk, moose (sometimes on the ski slopes), bison, mountain goats, big horned sheep, and wolves. In 2004, we made our first of many trips to the Scottsdale and Phoenix areas of Arizona. Ian enjoys the golf and the guacamole, and Jen enjoys the dry air, the beautiful vistas, and of course, the spas. Though usually seen when no decent camera is around, we have also had some good wildlife sightings on these trips including jackals, wild horses, and bobcats. The desert has become a favorite destination for us, particularly for long weekends. The view from the Four Seasons Resort in Scottsdale, Arizona. See www.fourseasons.com. In 2007, Jen's brother, Steve, moved to San Francisco, California. We were sad to see him leave the East Coast, but now we get to visit him regularly in the magical city that is San Francisco, where it is spring every day, good wine flows from the faucets, and the required attire is a hoody. This description isn't too far from the truth. With Steve and his wife Ashleigh, we have extensively explored the city and the Napa and Sonoma areas, where much wine has been consumed. The O'Brien Estate winery in Napa, California in the fall. See www.obrienestate.com for more information. The wine tastings here can be described as epic--the pour is heavy, and they entertain you with a good tale on the history of the winery. In 2007, we also made our first trip to southern Africa--Botswana and Johannesburg and Cape Town, South Africa. Jen never doubted, ever since she was a child, that she would make this trip. It was just a matter of when and how. Apparently, 2007 was when because Jen would not take no for answer; we were going. That first trip was amazing, eye opening, life changing, and expensive. We have since come to learn that we grossly overpaid for that first trip, which is part of the impetus for our starting this website and blog. Trips to Africa do not need to be budget breaking once in a life time vacations. After that first trip, we were addicted; we had been bit by the Safari Bug. And, as a result, we have been back to southern Africa--South Africa, Botswana, Zambia, and Zimbabwe--many times. This photo is from our first trip in 2007. Our camera was not very good, and we were so excited that we took photos of everything! We thought every photo we took was amazing, even the blury ones. This photo is from an elephant interaction activity that is available at Baines' Camp in Botswana. See www.sanctuaryretreats.com for more information. There are many fantastic places to visit outside of Africa, the U.S. ski mountains, the Arizona desert, and the wineries of California, at least according to Ian. So, in 2010 we made a trip to the Greek islands of Santorini and Crete. The Greek isles should not be missed. They are beautiful, and the seafood is amazing. Greece is a must see again for us. 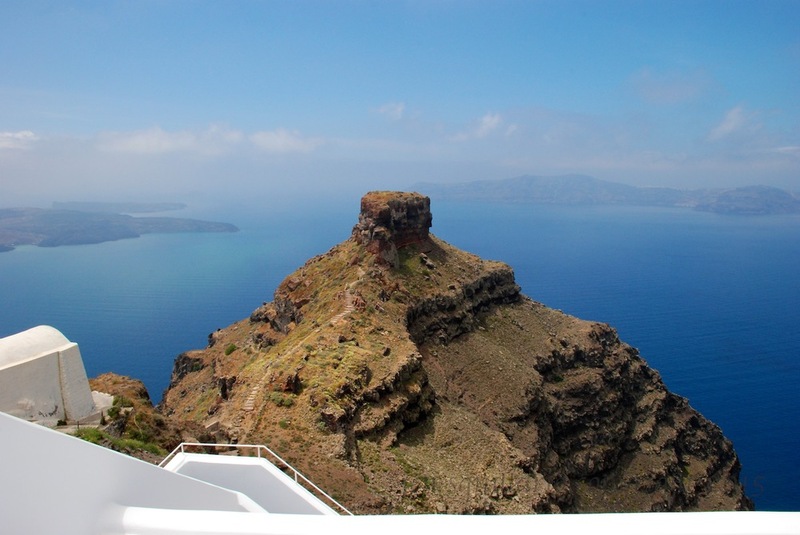 The view from Astra Suites in Santorini, Greece. See www.astrasuites.com for more information. The next year, in 2011, we traveled and ate and drank our way (Jen never met a pasta dish she didn't like) through Italy--Rome, Florence, Tuscany, and the Amalfi Coast. Then, in the summer of 2013, Ian spent two weeks in Rome for work (how lucky is that!). Ian is hoping to get Jen back to Rome soon to share with her some of the restaurants and running routes he discovered in Rome while working there. The view of the fishing village in Sorrento, Italy. 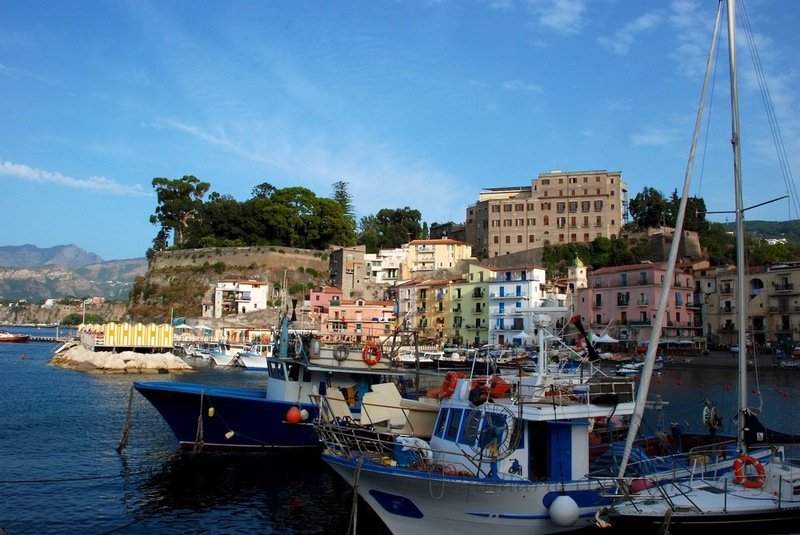 Sorrento is a good starting point and/or home base when exploring the Amalfi Coast. The pizza here is great, and there are streets with shops and restaurants to explore for hours. We have been fortunate to spend much of our free time traveling to many different locations, some of which we haven't even mentioned yet like New York City (a bit unfair as Jen went to college there), Las Vegas, the beaches of Florida, Bermuda, Jamaica, and Mexico, and the mountains of Vermont and Colorado. We hope with this blog and website to share our travels, travel advice, travel memories, and travel photos of many of the places we have visited. But, our primary love and the primary focus of this website and blog will be our travels through southern Africa (Botswana, South Africa, Zambia, and Zimbabwe; we still haven't made it to Namibia!). This photo was taken at Savute Camp in the Linyanti Concession in the Okavango Delta, Botswana. See www.wilderness-safaris.com for more information. We tracked this male leopard by listening to the squirrel alarm calls. By following these calls, we were able to locate the leopard who was scent marking his territory. He then jumped up into this tree for a siesta.